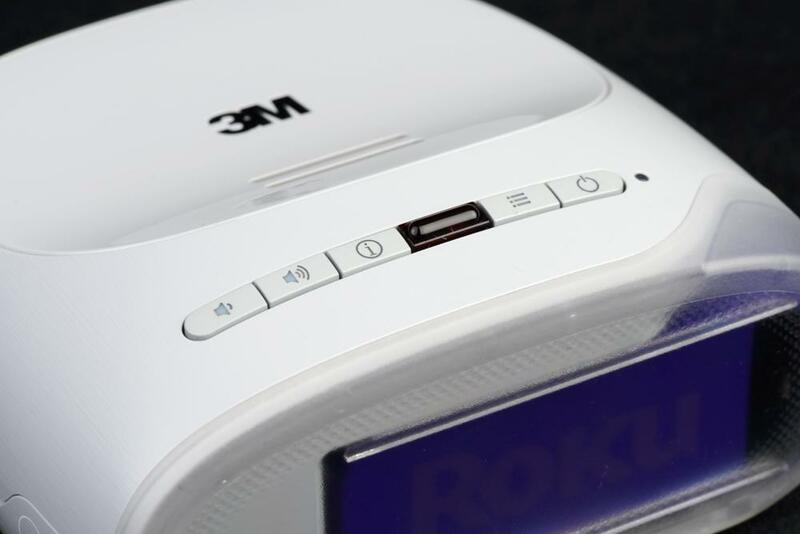 The 3M streaming projector powered by Roku is a huge hit, as far as we’re concerned. Both the projector and the Roku streaming stick that comes with it are multitaskers in that they can each be used with other devices around the home. To be perfectly honest, I almost wrote the 3M Streaming Projector off as soon as I’d heard about it. I love the idea of a mini projector — which is why I started paying attention when they started to surface — but, time and time again, my hopes of obtaining the perfect little travel projector have been dashed by either poor specs, lack of features or out-of-reach pricing. But when Digital Trends received a test unit soon after, I insisted on giving it a proper evaluation and review. I’m glad we did, because this little device is a lot of fun and has great potential as a gift this holiday season. 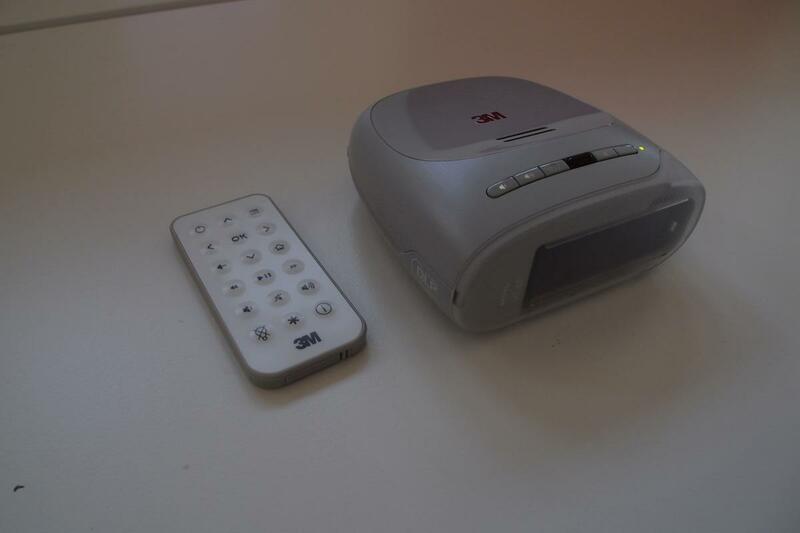 Read on for my take on why I think this mini-projector may succeed where so many others have failed. This little projector by 3M manages to strike just the right balance between for light weight for portability’s sake and just enough heft to let you know you’re not dealing with a kid’s toy. The projector measures roughly 2 x 4 x 4.5 (H x W x D – in inches) and weighs a mere pound. While it may not fit in your pocket, it will certainly stash away conveniently in a backpack, overnight bag or suitcase. Overall, the projector has a solid feel, with a rubber ring on its underside to help avoid slippage and a glossy, slick plastic piece lining the top with 3M’s logo. Our only real complaint regarding build quality would have to be the plastic “door” which hides away the projector’s HDMI and MHL connectors. The hinge on this door is tiny and feels as if it could break away if placed under even moderate stress. In the box along with the projector we found a DC power supply, adapter tips for both US and European power sockets, a card-style remote control and a Roku streaming stick. To enhance portability, the 3M streaming projector packs a rechargeable battery, which the manufacturer claims will run for “over two hours”. This figure will probably change based on brightness and audio volume settings, but we feel safe saying that the projector should last long enough on its battery to get you through most movies of reasonable length — Gandhi is definitely out, though. The projector is rated to output 60 lumens which, while not a lot, is a touch better than most competing mini-projectors. The one notable exception to this rule is a projector made by AAXA which boasts 110 lumen output, but is all but unavailable. 3M opted for a DLP image chip made by Texas Instruments rather than, say, an LCD or LCOS chip, which are popular in other projectors. The main advantage to a DLP chip is that it doesn’t degrade over time, offers excellent color uniformity and has very little space between pixels, which results in a smoother image overall. The projector’s resolution maxes out at 800 x 480, which is another way of saying you get DVD quality. 3M claims the projector can sustain up to a 120-inch diagonal image but, as we’ll soon discuss, you’re not going to want to try to go anywhere close to that size. Along the top of the projector are a series of control buttons which, in addition to basic power and volume controls, allow access to the projector’s menu where brightness, contrast, image orientation and PC/Movie image preferences can be adjusted. It’s nice to have them there, but you’re going to want to keep the remote handy as it is far easier to use. Along the side of the projector we found a DC power input and a 3.5mm audio output jack for connecting the projector to external audio systems. Right next to the audio output jack is a small grill which hides the unit’s fan. Continuing to the front of the projector we find another grill sitting right next to the lens, which hides a built-in speaker. Just beyond the lens is a rotary dial for adjusting image focus. Underneath the unit we found a threaded insert, which will allow the projector to be mounted to a tripod. This is a crucial design point since the projector likes to be level with its image display height, lest the image become distorted. 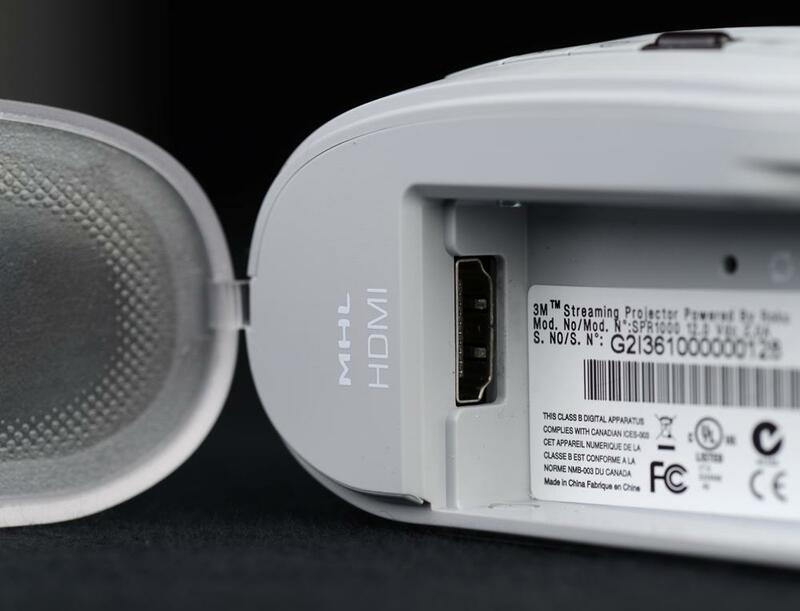 Finally, we come to the back of the projector where, once we pull back the cheap, clear plastic door, we find an HDMI input and a Micro-USB input for use with MHL compliant mobile devices. These two connections mean that a wealth of devices can be connected to the projector, be it a Blu-ray/DVD player, HDMI-equipped laptop, mobile phone or tablet. Of course, 3M suspects you’ll want to use the included Roku streaming stick. 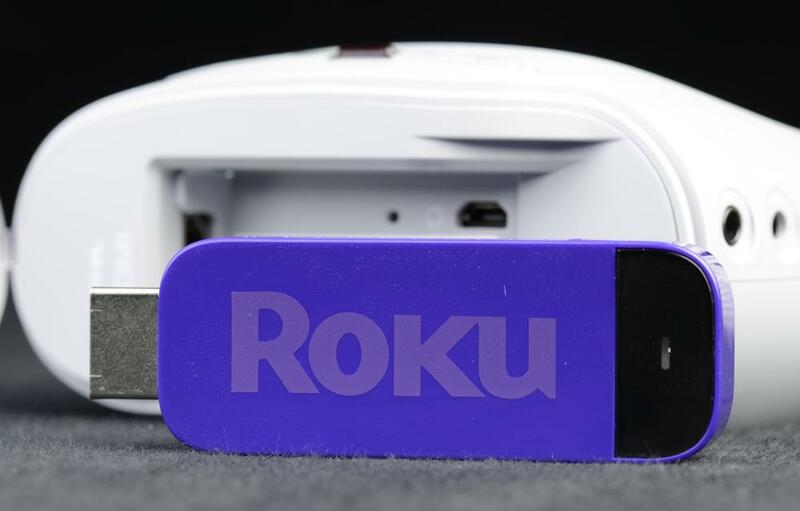 If you’re not familiar, the Roku streaming stick is essentially a Roku box packed into what looks like an oversized thumb drive. On the end, however, is an HDMI plug. Using the projector’s included remote or a free mobile app from Roku, users can navigate to over 600 channels of content and watch it all on the projector — or any TV or monitor with an HDMI inputs, for that matter. Those two preceding facts are this projector’s biggest selling points. The Roku streaming stick purchased on its own will cost you $100. That means that you’re getting a projector to go with it for about $200, which is well below the cost of competing mini projectors. Since each device can be used outside of the intended combo, you’re getting a lot of functionality from one purchase. That sounds like value to us. 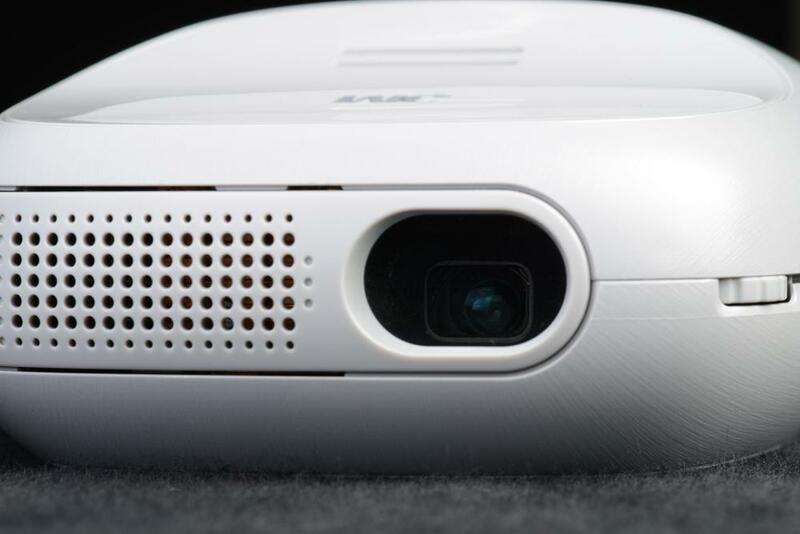 We went into our evaluation of the 3M streaming projector with tempered expectations. As stoked as we’d all be to get a true cinematic experience from $300 projector, it just isn’t going to happen. This isn’t going to be the centerpiece of any home theater you’d want to show off to friends. Rather, this is the kind of device you want to pull out for a kids’ slumber party, a fun movie experience at a summer party, some clutch entertainment at a campsite, or if you live in a van… down by the river. The first thing you’ll need to enjoy this projector is a screen of some sort. It could be a wall, a sheet, a big piece of plywood or you could spring for the portable screen 3M offers on its website. Whatever it is you choose to use, results will be best if the surface you’re projecting onto is white. White refracts almost all of the visible spectrum of light and, thus, is the best choice for displaying a projected image. If you really want to go crazy, there are paints on the market specially made to work best as a projection surface. Paint whatever you want, but you’ll need the surface to be flat and smooth, otherwise you’ll end up with distorted or textured picture. The next thing you’ll want is a darkened environment. Projectors play off the absence of light, so the more ambient light you have in a room, the more washed out an image will look. Ultra-bright projectors can combat ambient room light, but the 3M is no-where close to being a bright projector, as we’ll soon discuss. Finally, for the largest images, you’re going to need space. The further away from the wall the projector is placed, the larger the image will be. Keep in mind, though, that the further away you get from wall, the dimmer the image is going to get. We started out testing the 3M streaming projector under the most ideal of conditions: a totally blacked out room with a bright white wall large enough to show a 120-inch image and enough space to pull the projector back far enough to get to that size. Rather than start out with the Roku streaming stick installed, we connected a Blu-ray player to the projector using a short HDMI cable. As we did, we noted it was a little difficult to maneuver the HDMI into the projector’s input. This turned out to be a moderate challenge with the Roku streaming stick as well. We viewed three different movies using the Blu-ray player, including Cars, Cloudy with a Chance of Meatballs, and Super 8. We started at a distance of about 8 feet, which yielded an image measuring 70-inches diagonally. We were pretty impressed with what the little projector was able to do. 70 inches is fairly big and, at that size, the image was bright enough to enjoy, with surprisingly good color, especially considering the unit’s low cost. The dark room we were in started to feel just a little bit like a real home theater, though it was clear that the projector wasn’t able to pull off very impressive contrast due to its limited brightness potential. We were pleased to see that using the Roku stick provided similar results in terms of resolution. Even standard definition TV programs looked ok. We were a little perturbed with how difficult it was to insert and remove the Roku stick, though, and found it frustrating that the remote requires such direct line of site to the stick, which lives on the back of the unit; although, anyone with an iOS or Android mobile device can get around that hassle by using Roku’s free app. Performance in rooms with some ambient light coming through wasn’t quite as bad as we had anticipated. The image was still visible on a gloomy, raining Pacific Northwest afternoon. But once powerful fluorescent lights got involved, it was game over for the projector. It just can’t battle that kind of bright light. What we found most underwhelming was the projector’s sound, which was only good enough to let you hear, just barely, what was being said on-screen. This projector begs for external audio. Even a modest, battery powered portable speaker like the Braven 600 is enough to get the sound to a respectable level for a small audience. Any more than just a few people, though, and you’ll want to scale up the sound to match. Unsatisfied with 70 inches, we pulled the projector back to a distance of 11 feet from the wall. This grew the image size up to about 100 inches measured diagonally. At this point, the image began to suffer. Focus became the biggest problem for two reasons: adjusting focus using the built-in rotary dial was difficult because the dial is so loose and sensitive that it was far too easy to whip right past the ideal setting. Also, focus was uneven across the picture, with the sharpest image toward the center and considerable blurring in the outer third. Brightness also took a hit at this distance, which made smaller objects and text too difficult to make out. With performance starting to suffer at 100 inches, we wouldn’t recommend pushing it any further than that. But we went ahead and tried anyway. Getting 120 inches of picture required that we pull the projector back to about 15 feet. At this distance, brightness suffered a little, but it was the projector’s poor resolution on small objects that was difficult to get around. Closed-caption text, for instance, was unreadable. Still, the sheer scale of the image was impressive. We can’t imagine kids being anything less than totally wowed by the massive picture and, on a dim evening, the projector has the chops to display a football game outdoors on a scale large enough for anyone to see. Just don’t count on being able to read the score. The 3M streaming projector powered by Roku is a huge hit, as far as we’re concerned. Both the projector and the Roku streaming stick that comes with it are multitaskers in that they can each be used with other devices around the home. And considering that a Roku streaming stick sells for $100 on its own, the $300 price for this combo is more than palatable; it’s down-right appetizing. It’s this kind of versatility and value that has us thinking this product is going to be a big success, if not on the long-term, at the very least over this holiday. Since this is the first product of its type that we have formally evaluated, we can’t offer it a rating in the context of its competition, per se. We do, however, recognize that this projector offers superior features thanks to its inclusion of the Roku streaming stick, built-in rechargeable battery and MHL compliance. As such we award the 3M streaming projector powered by Roku a score of 8 and a Recommended Product award.